Oh the puns I could do with this phrase…. But I will not bore you with ALL of them- just the one I am going to base this post on. Our March Madness. If you haven’t noticed most things on this blog has our or us in them because Mom and I are a team. Just like these basketball teams playing this week. The way they win their game is getting the most baskets, scoring the most points. In our game we are trying to get through the day with the least amount of slip ups and stress. Hm kinda different huh? So the team all has the same goal but the different players have a different role in achieving this goal which creates different smaller goals for themselves. Same in our game. This past weekend was St.Patrick’s day and if you don’t know, which many of you probably don’t, I am an Irish dancer. So this weekend has been go, go. GO. We were booked with parades, performances, news shows, parties, you name the celebration we were there. My saying this has a point, our game this weekend was getting through it without a mess up, missing something, and killing each other from the stress and the craze of it all. My role, as the dancer was to get myself ready ( wig, makeup, costumes, etc), dancing, and to have fun. Mom’s job was to get me there, make sure I stayed safe, happy, fed, and un-injured, and of course take pictures!! Our goal together was achieved, this St. Patrick’s day was a blast and everyone stayed happy and healthy. Believe it or not that was only a part of our March Madness. 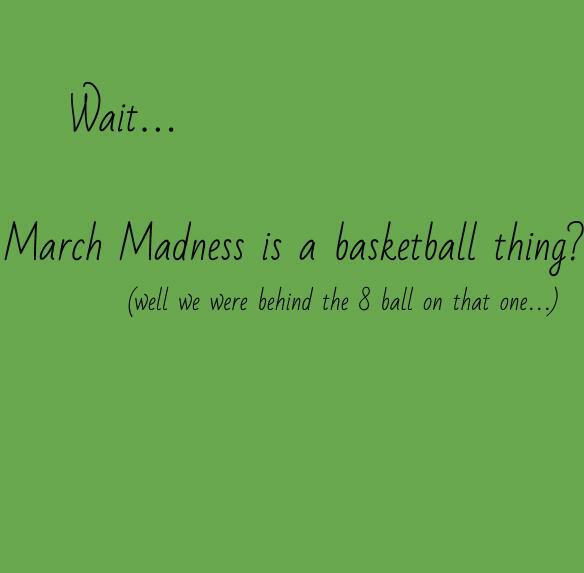 March Madness happens to fall at…mid-term… Oh there are the good and the bad with this time of the year. Good- Only half a semester till schools out for summer!!!! The time of year all kids ages 5-18 look forward to. But it also means you better take a long look at those grades and figure out how to help them or explain to your parents and future colleges why they are what they are ( just kidding Mom my grades are fine-pinkie promise! Haha) . For many students this is/was a time for testing– lucky for me I didn’t have any mid-terms. My mid-term is quite hectic. For my beautiful Mama it means figuring out what to do with us kiddos this summer. Finding camps, a nanny, what dates she and Dad need to take vacation, etc. For her she looks at the year and thinks “Did I get everything done I needed to get done?” “How much more do I have to do?” . And we all know these questions can only do one thing. Stress us out. I don’t want to end a note like stress because just like it is never good to leave a fight angry, it is never good to end a post negative! Haha. And spring time is something that makes all of us VERY happy! The sunshine, fresh fruit, green veggies, warm weather, seersucker pants (random but come on seersucker season is here people! And I for one am very happy!!) make me smile. And I love to smile.